A mass of bees “wandering in from the country” swirled along Broadway, forcing dainty young women and the toughest police officer to seek cover in a vain attempt to avoid being stung. “Whether attracted to the neighborhood by the bevy of pretty girls who happened to be there or by the flowered hats on display in the show windows is not known,” The Times said. 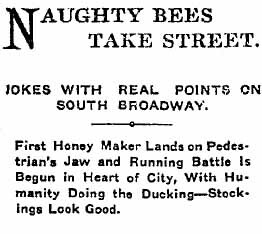 The bees appeared around 6th Street and South Broadway, where women dropped their packages and hiked their skirts to run for safety. The sight of all those women’s stockings “would have caused a barber’s pole to blush,” The Times said. A patrolman came to investigate the ruckus and was stung. “From the entrance to Mercantile Place to the car tracks on Broadway the bees covered the pavement,” The Times said. Fanciful or not, the newspaper reported that one of the bees became enchanted with a Victrola in a music shop playing “Honey, I’ll Sure Be Yours” and came off second best with the phonograph. After about an hour, the bees drifted up Broadway. At 3rd Street, a frightened woman deserted her flower stand, and at 2nd Street, the merchants discussed whether to call the Fire Department. But before firefighters could respond, the bees moved on toward Buena Vista (later renamed as a continuation of North Broadway). This entry was posted in 1907, Black Dahlia, Books and Authors, LAPD, Music, Streetcars. Bookmark the permalink.